It is important to note right from the start that this article is intended to offer guidelines, not official tax advice. To get specific help in filing 2014 taxes and obtaining financial incentives according to the 2014 tax laws, please seek professional tax advice. To get answers to tax questions and find out more about your personal tax liability, speak with a professional accountant or tax expert. Now that January is well under way, it is time for the average American to begin thinking about taxes. The official 2014 calendar tax year is over, and that means people all over America will begin to see W-2, 1099 and one of particular interest to home owners, the 1098 form showing up in the mail. The 1098 is a special tax form that is known as the Mortgage Interest Statement. On the 1098 home owners will get the official figure of how much money they paid to their lender in interest over the calendar year. This form is just one of the ways home owners can make use of specific tax advantages from owning a home. All home owners may find great advantages to owning a home when they file their 2014 tax forms whether they have a mortgage or they bought their home for cash in full. Find out if any of these tax laws will help you in your situation by consulting a qualified tax specialist. One of the most common ways home owners can take advantage of 2014 tax breaks is to declare the interest they paid on their home mortgage. Since a large portion of home owners have a mortgage, this tax advantage is one of the most popular and helpful pieces of legislation to aid the American consumer. This incentive is at its best in the early years of a loan because most mortgages are “front loaded” meaning they are amortized to pay the lender their loan fee (interest) quickly, and pay the principle off last. The payment doesn’t shift to principle majority until after the 10th year of a standard 30 year loan. Initially, the monthly payments are largely made up of interest with very little of the actual loan amount being paid down. It isn’t just regular first mortgages that get benefits from this portion of the tax law. Second mortgages and refinances are allowed to be included in the tax break from interest payments. Interest on home equity loans (HELOAN) and lines of credit from home equity (HELOC) are also deductible. The only restrictions on any of the above loans are where home owners force their debt from home loans above the actual market value of the property in question. There is also a 1 million dollar cap on the size of these loans. Homes and properties purchased for more than the 1 million dollar limit are exempt. Home owners who are considering jumbo mortgages for luxury properties or homes in high income areas such as New York, California or Chicago should limit the loan sizes to $1,000,000 in order to stay eligible for the tax deduction. Home loans over that amount will lose out and not be allowed to claim any interest paid on the loan. It isn’t just the interest paid on the loan during it’s term that can be applied to your 2014 tax form. You can also claim any points paid at closing during the 2014 year. If you paid closing costs to reduce your interest, that is simply interest in advance, and you are allowed to claim in on your tax forms. Discount points are a way to pay down the interest on your mortgage either to compensate for high interest due to credit problems or other issues, or to lower the rates below the current market loan rates. One point is equal to one percent of the loan size. For example, on a $625,500 home loan at the current rate of 3.5%, one discount point will give the home owner a term interest rate of 3%. That can mean a lot of savings over the total loan, and lower monthly payments. One point on the above loan would cost about $6,250. The Internal Revenue Service considers discount points paid at closing “prepaid loan interest.” It is an advance on interest, paid before the actual mortgage term in exchange for a reduced interest rate on the loan. This makes discount points deductible when used in this manner. There can be some variation on how the points are applied to the tax law. When discount points are used to pay off a initial purchase, they are usually deductible in full in the current tax year. Refinances are usually subject to amortization over the term of the loan. In the case of a refinance on a 30 year loan, the interest would be valued at 1/30 of the total value of the discount points for the tax year. This bulk group of tax breaks consists of three separate issues, only one of which is common to most home owners: property taxes. Whether you paid for your home with a single cash payment or have any form of mortgage, you have to pay property taxes to the local government. These taxes are deductible each year for the current tax year. This is true whether you pay the tax yourself out of pocket, or if your mortgage company pays the property taxes for you from an escrow account. If your mortgage company pays your local property taxes, you will get a form from them stating how much was paid for the current tax year. Check with your accountant to help determine the proper deduction for property taxes. Home improvements are sometimes deductible. 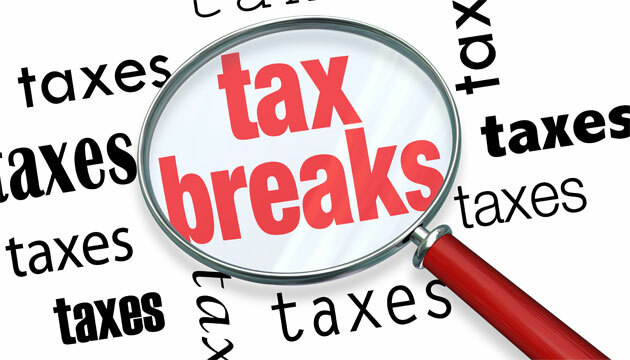 There are certain stipulations in regards to what improvements qualify for tax breaks. For instance, medical needs such as handicap access ramps are usually deductible up to 100% even if they do not improve the home’s value. However, aesthetic improvements are not deductible except in certain situations where they add value to the property. Check with your professional tax specialist to find out if a home improvement meets the requirements for a tax break. Home office tax breaks are tricky and should always be handled by an accountant. There are many ways individuals who work from their home can take advantage of the costs of renovations required for office needs, phones, heat and electric costs and even a portion of the home costs. There are certain liabilities and issues regarding some of the areas of home office tax breaks, so always consult a professional when claiming them. Deductions from interest and other home related values can greatly reduce the cost of owning a home. It may make the difference when considering the pros and cons of buying a home vs. renting. Keep in mind when evaluating the budgeting situations that tax laws change on a regular basis. The incentives available now may not be the same in several years. They may be better or they may be less advantageous. It is always best to evaluate the budget of owning a home using current market values without tax incentives included. That way no matter what happens, you can always be happy with your decisions. Ask a tax adviser to help you make your purchasing decisions by building a good over view of what tax breaks are available. Use current ‘real’ mortgage rates rather than historical rates. True home mortgage rates may be much lower than averages, such as the exceptionally low rates of the current market. Keep in mind that the type of loan you get will also impact the tax advantages you get. The term of the mortgage will determine how long you can make tax claims on your interest payments. A 15 year loan will offer far less interest savings over the course of the loan than a 30 year loan will. That is due to the fact that this type of loan requires far less interest paid over the course of the mortgage. Fewer interest payments means less deduction possibilities. However, a 65% reduction in interest may be well worth the tax savings lost.